Principal Brenda Scholl and the entire staff of the River Island Technology Academy are preparing for two related events to be held on the same day: the annual fun run in support for the Second Harvest Food Bank and the 8th Grade Pancake Breakfast. Both events are scheduled for April 14th, and both start at 8:00 AM. There are now two different starting times to better suit the different types of runners. 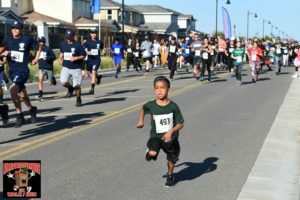 A one-mile run starts at 8:00 AM, and a later start time, at 8:30 AM gives those who want to do a 5K run their own start time. Everyone who participates receives a Finisher Medal, and the first place winners in the Men’s and Women’s categories based on eight different age groups will receive special medals for their achievements. The second event, a Pancake Breakfast, starts at 8:00 AM and runs all morning, during and after the run. For more information and registration forms (registration closes on Wednesday, April 10th! ), go to the administrative office of River Island Technology Academy, or go online to http://www.riverislandsacademy.net/run-and-pancakes/.